After the Second World War, in the late 1940s, Spencer Clarke of Northampton became the owner of both the Drage shoe business and Bozeat Boot Company, known locally as the BBC. It is assumed that the Bozeat Boot Company had been set established by the Botterill’s, however this arm of the company had come into some financial difficulty and was sold to Spencer Clarke in recompense for debts owed by the Botterill’s, who retained an interest in the company. In 1952 Ron Coles was appointed Manager of the Bozeat Boot Company and that year for the first time and to the pleasure of the owners did not lose money. The manufacturing policies were changed and the company began to specialise in these products only: sandals for the summer season, balanced by work boots, shoes, and football boots for the winter season. With the specialisation of the products, the company began to prosper and expand, opening up units in Kettering, Wellingborough and Olney and profits became good, increasing each year. The company discontinued the manufacture of sandals with the introduction of the training shoe, being the first company in the country to produce trainers and one of the first to produce football boots with the moulded multi studs. Mr Coles was made director in 1960 and then Managing Director. 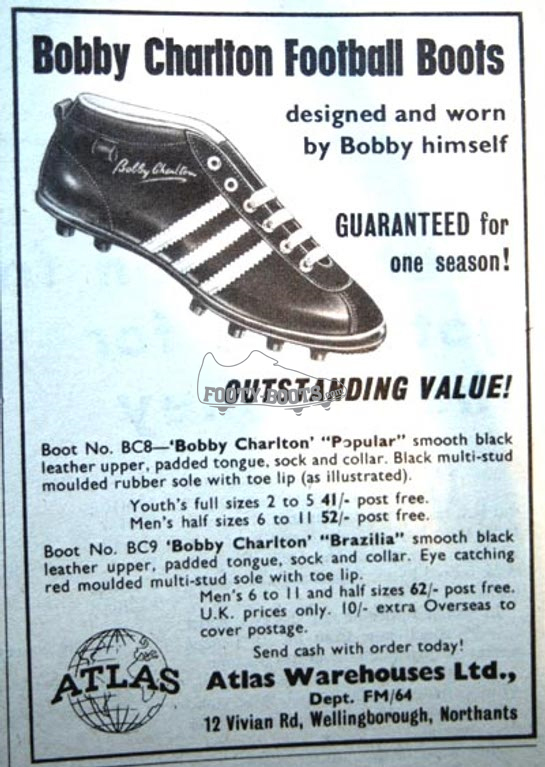 He met and signed Bobby Charlton at the age of 19, Bobby helping to design the Bobby Charlton football boot (photo). Bobby Moore was also signed and the products produced under his name were sold through the G.U.S. catalogues. In 1970 the company decided to introduce a new brand and the Managing Director approached Jimmy Hill, who at the time was setting up a consultancy. The brand name that was evolved was ‘Lightning’, with a lightning flash being designed for the products. In 1974 the company along with Botterills was bought by a major public company and traded under the name of Gola Sports Limited. Sadly in 1981, the Gola Shoe Factory in Easton Lane, as it was now known, closed and all its workers made redundant.